recycle it! : Store grocery bags neatly and keep them handy for reuse. versatile placement: Mount the grocery bag holder on the wall, under a shelf, or inside a cabinet. easy tuck opening: Tuck bags through the top opening for clutter-free storage. wide dispensing area: Keeps bags handy for reuse. 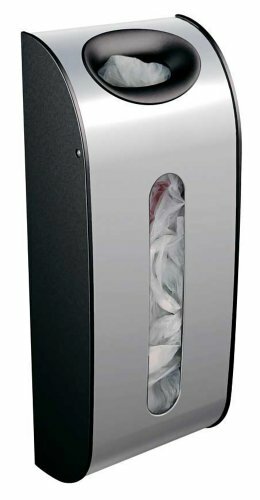 Mount this simplehuman grocery bag dispenser on a wall or inside a shelf for convenient, easy access. Stores 30 plastic grocery bags. Simply tuck them into the top opening, and pull them out from the wide dispensing area on the front of the holder. Durable stainless steel construction. Screws and double-sided tape included.